Which Of These Grocery Stores Is Best For Real Estate? In July, the National Association of Realtors released its 2017 National Housing Pulse survey that revealed buyers are willing to break the bank in order to own a home, mainly because of the benefits of building equity and long-term wealth. So what should buyers consider when choosing a home that will yield the highest return on investment (ROI)? Proximity to great schools? The value of surrounding homes? Maybe they should take a look at the grocery store down the street. In their latest study, Attom Data Solutions’ researchers analyzed current average home values, five-year home price appreciation from YTD 2012 vs YTD 2017, current average home equity, homeseller profits, and rental data from 1,275 zip codes to determine whether Trader Joes, Whole Foods or Aldi rendered the highest ROI for owners and investors. When it comes to purchasing a home, the study revealed buyers would be wise to choose a home near Trader Joes since they highest home price appreciation and equity growth compared to its competitors Whole Foods and Aldi. Homeowners near Trader Joes experienced an average five-year home price appreciation of 67 percent, 15 percentage points higher than Whole Foods and 16 percentage points higher than Aldi. The average five-year appreciation for all ZIP codes nationwide with these grocery stores was 54 percent. 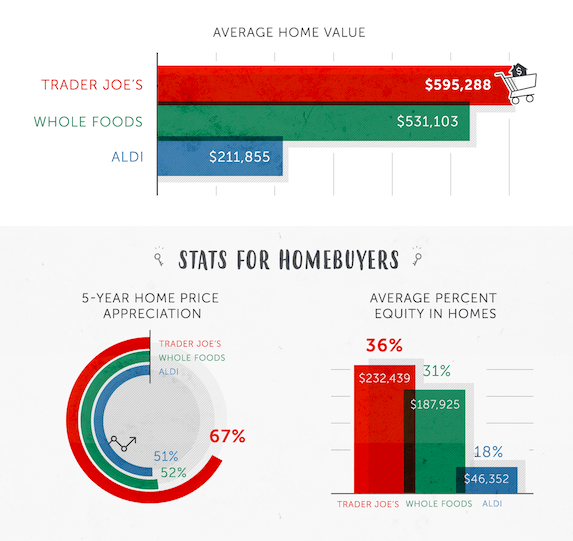 When it comes to equity, homeowners near Trader Joes experienced 36 percent equity. Homeowners near Whole Foods weren’t far behind with 31 percent equity and homeowners near Aldi shored up the end of the pack with 18 percent equity. Although Aldi didn’t render the highest ROI for owners, it’s a complete 180 for investors looking to flip homes near this discount grocery store. 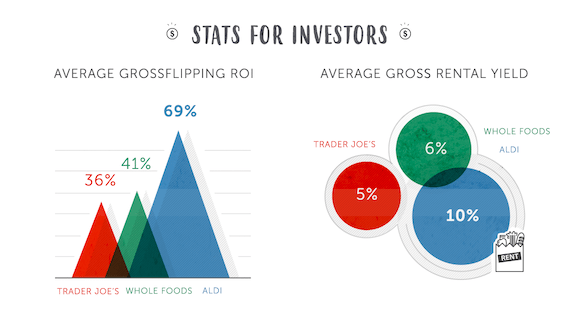 Investors who flipped homes near Aldi had an average gross flipping ROI of 69 percent — a whopping 28 to 33 percentage points higher than the ROI for homes near Whole Foods and Trader Joes. Furthermore, homes near Aldi had an average gross rental yield of 10 percent, which is higher than the gross rental yield of Whole Foods (6 percent), Trader Joes (5 percent) and the national average (8 percent). Attom SVP Daren Blomquist wasn’t available for comment on the “whys” of the results, but a similar study done by Zillow revealed that Whole Foods and Trader Joes are incredibly efficient in choosing their locations. Beyond grocery stores, big box retail chains and other recognizable brands also have an impact on home appreciation and equity. For example, homeowners near Target experience a 27-percent increase in home appreciation, which amounts to an average price gain of $65,569. Meanwhile, homeowners near Walmart only experience 16 percent increase in home appreciation, which amounts to an average price gain of $24,900. When it comes to another recognizable brand, Starbucks, the median value of homes located near a Starbucks in Boston appreciated 171 percent over a 16-year period compared to 126 percent for other homes during the same time.